Perhaps surprisingly, until recently there were just three closed road sportives in the UK: one in England (RideLondon) and one each in Scotland (Etape Caledonia) and Wales (Velothon Wales). The RideLondon event is probably the best known and this race report will give you an idea of what it is like to cycle with thousands of other cyclists on closed roads. 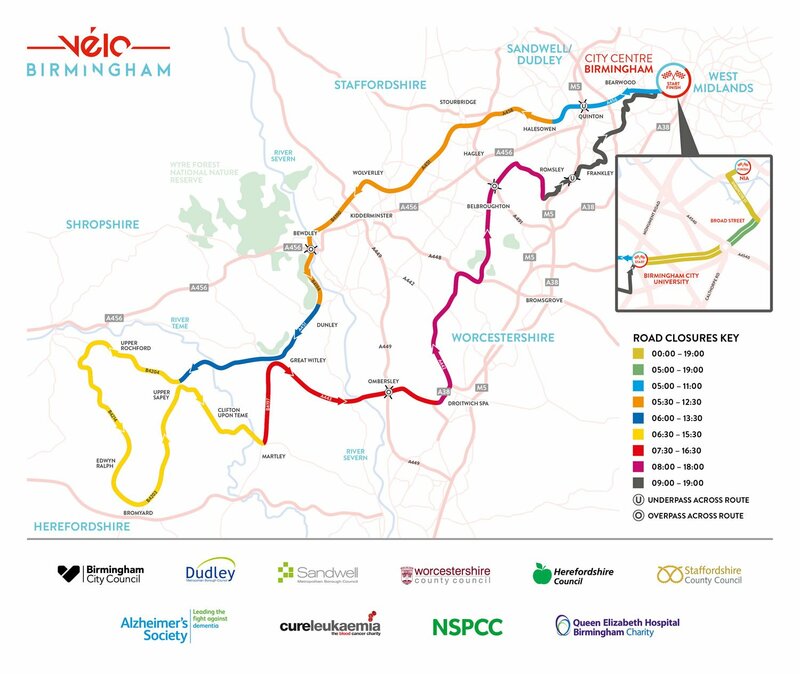 Later this year, Velo Birmingham will become the fourth closed road sportive and having sold out within 4 days, it looks like there will be 15,000 happy cyclists on Sept 24. Note from Monty: This is a guest post written by Mark from bikes.org.uk, a UK-based blog for cyclists of all disciplines. Let’s start with some key facts on the event. The route is 100 miles or 160km in new money and whilst the official climbing data shows 6,550ft, when loading the GPX file into Strava, it shows 7,140ft, as do other mapping tools. 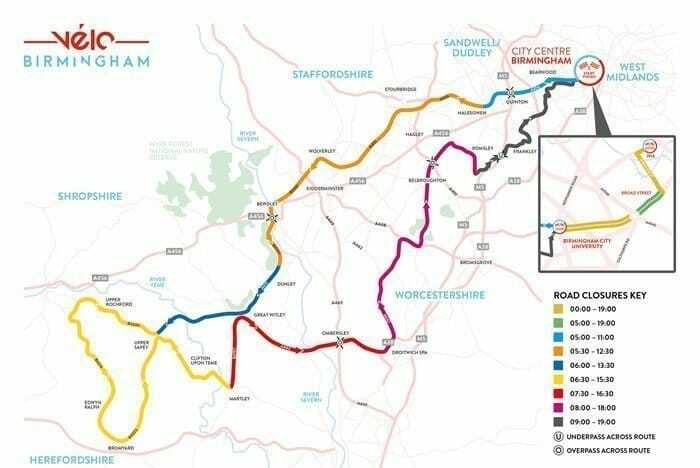 In addition to cycling through Birmingham City Centre, you’ll cycle through four of the West Midlands counties; Sandwell & Dudley, Staffordshire, Shropshire and Worcestershire. As you’ll see later, this is a predominantly rural sportive which passes through some beautiful countryside. The climbs are shallow gradual elevations and when legs are fresh, you’ll hardly notice them but as the miles increase and tiredness creeps in, you may start to notice those hills become just that little bit more of a challenge. The key to climbing on this sportive is to ensure you’ve trained for it and you have the stamina to complete a seven, eight or nine hour bike ride. Overall, there are six climbs but more experienced cyclists may dispute this. However, as not every cyclist will be a seasoned, saddle-sore warrior, I’m going to walk you through each elevation, regardless of gradient. The average gradients range from 1% to 5% and elevations from 300ft to 700ft, so there’s nothing too difficult, even for the less experienced sportive participant. If you’d like to view the interactive route map, just click on the following link for a full map of the Velo Birmingham route on the ridewithgps.com website. The route includes several officially designated climbs, two Cat 3, one Cat 4 and one Cat 5. The following table lists each of the climbs, alongside the total elevation and average gradient for each climb. The first climb comes after 26 miles and is a pretty easy up and down climb from Yarhampton to Stanford Bridge. It’s a gentle climb that climbs 500ft over 3 miles with a short section that peaks at an 8% gradient. Pretty much as soon as you’ve reached the bottom of the descent, you’ll start the second climb. This is from Stanford Bridge to Hanley William and is slightly longer than the first climb at 3.4 miles and slightly more climbing at 625ft. This gives an average gradient of 3.5% but there are a few deeper sections, one at 12% so don’t go too hard too soon on this one. There is also a sharp right-hand corner to consider, which turns into a narrow country lane so be careful on this section. The next climb is a breeze. 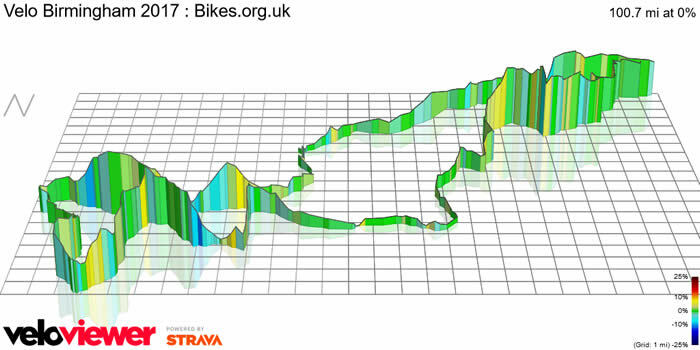 Starting at the 40 mile mark, this 5.5 mile stretch climbs just 345ft, giving it a low 1.5% average gradient. This climb will hardly be noticed by many cyclists but for the sake of less experienced sportive participants, I’m listing it as a climb. Starting at Nineveh, you’ll cycle through Kyre Park, Bank Street, Collington and finally Edwyn Ralph. At just 1.3 miles long, the fourth climb from Bromyard to Norton is the shortest in length and also has the least elevation at just 290ft. However, before you think this is the easiest climb, the average gradient is the highest of all six climbs at 5%. By the time you finish the fourth climb, you’ll have reached the halfway mark and have completed 50 miles, or 80km if you prefer. It does sound longer. Hopefully you feel good and after a short feed break, you can crack on to the second part of the route. As you approach the 100km milestone (shouldn’t that be kilostone? ), you will have completed the descent from Clifton upon Teme and crossing over the River Teme. This is one of the lowest elevations on the entire Velo Birmingham route and at just 100ft, it’s pretty darn low considering you are nowhere near the sea. The penultimate climb takes you onto the B4197 and whilst it’s name isn’t spectacular, the surrounding countryside is worth pausing to take in. The climb itself takes you from 115ft to 500ft in just under 4 miles, giving an average gradient of around 2%. Like the other climbs, it’s unremarkable, save for the left-hand turn after the first mini summit. Just to ensure you remember your first Velo Birmingham sportive, the organisers have set an appropriate challenge – just what we want after 75 miles! So, to complete the climbing element of the route, there is a 14 mile (25km) stretch from Hampton Lovett to St. Kenelm’s Pass. Whilst there are some steeper sections, the whole climb rises just 700ft so once again, a steady pace should ensure you complete it without too much strain. There will be some tired legs at this point but the climb only really kicks in as you turn off Kidderminster Road and onto Woodcote Lane. It does get a little steeper at this point but just pace yourself until you reach Belbroughton, which then gets a bit lumpier – an appropriate place to start the King & Queen of the Mountain challenges. There is an extensive Guide to Velo Birmingham Climbs available on the Bikes.org.uk website, which includes videos of each climb using images fused from Google Maps Street View. It’s a great way to visualise the climbs and makes an useful addition to the standard two-dimensional mapping tools images. Question from Monty: Are any readers doing the Velo Birmingham (I know quite a few of you have done RideLondon and are eager to find more closed road events)? Let me know in the comments below. Or just let me know what sportives you’re riding this year. 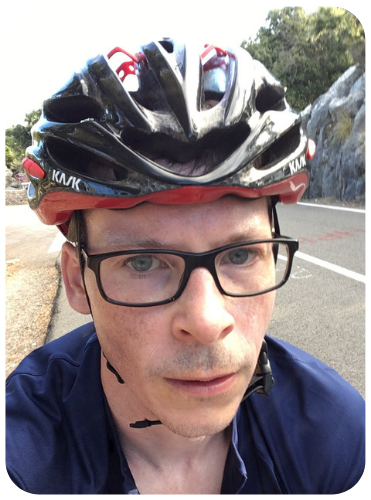 Hi Monty, I am in the Ride London 100 this year and am signed up for the Velothon in Wales but now due to a work commitment cannot do it so if anyone wants my place I believe I can transfer it for a fee. I like the sound of this Velo Birmingham one but did not register unfortunately. Tour of Cambridgeshire is also closed roads. Although if you want to get technical it’s a Gran Fondo rather than a Sportive. I liked the sound of Velo Birmingham but am doing LEJOG the week before so bit too soon after! Just a slight word of caution about the Herefordshire hills part of the B’ham Velo. I live in this area and am deeply familiar with most of the hills on this ride and can assure you that my fellow riders will need to bring their ‘Big Legs’ because these hills are short, steep and sharp. The gradients you mention are probably taken over quite a long distance and mask the real gradient of a short section of the hill (I guess Mt Everest has a 5% gradient if you take Wigan as your start point!). It will be a fantastic day for sure, but that middle bit could be a mare. If this goes ahead. The organisers completely screwed up the road closure application to the local authorities. I know that Worcestershire CC met last Friday but have not heard the outcome. Well I am doing it and in fact this event is the reason I bought a bike in the first place! A friend of mine talked me into signing up for the Velo Birmingham and, having not ridden a bike since being a kid (like 25 years ago! ), I had no idea what I had let myself in for! 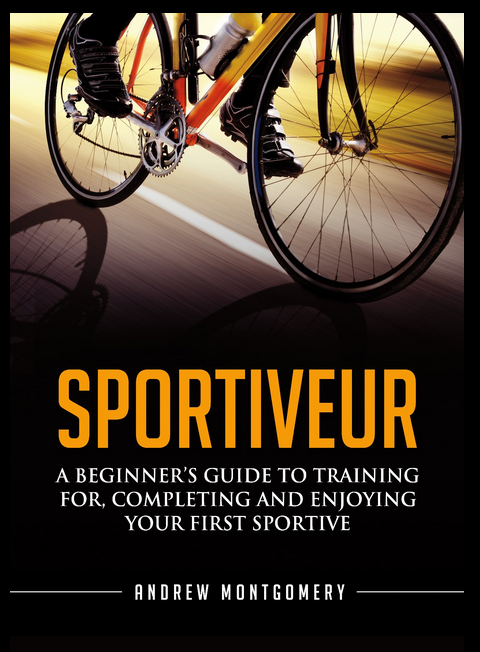 Anyway I found your blog and read your ebook and learned a lot from it – I had no idea how little I knew about cycling! So I have checked my Strava stats and I’ve managed 71 training rides, 2,750km horizontally and 30km vertically since early March. I also did 2 events as part of the training, the Wiggle Chilterns Classic (75 miles) and the Marlow Red Kite Ride (80 miles) both in the pouring rain but managed to finish them still smiling. And that’s it, I am fully tapering now ready for Sunday, fingers crossed it won’t rain a third time and good luck to everyone else taking part! I did it in less than 7 hours. Was pleased with this as a 75 year old. I agree, my Garmin showed 7,100 feet of climbing. It was a bit sadistic to put the hardest climbs at the end. A fantastic day apart from the sabotage attempts. The crowds particularly in Bewdley were amazing. My only gripe was no proper nutritional foods at stations, only sickly choc brownies, sweets and gels all far too sugary. If I had known would have taken my own SIS bars with me. I have asked the organisers if a final placings list is to be published, with even an age category section. No reply yet, anybody know.